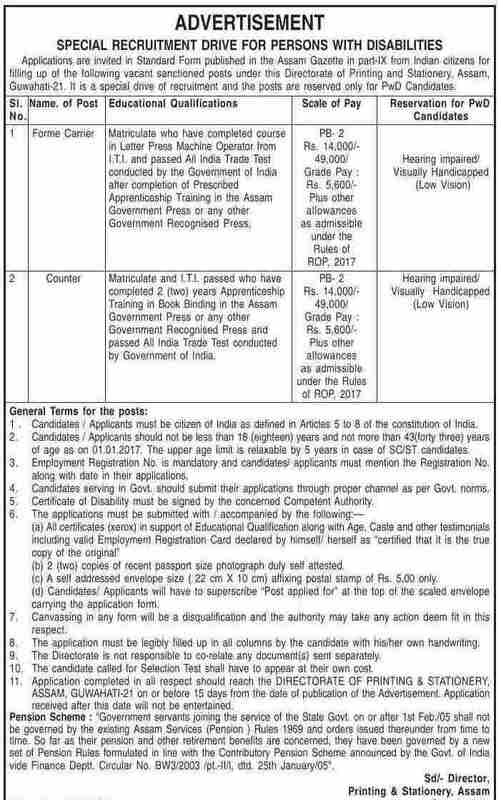 Applications are invited in Standard Form published in the Assam Gazette in part-IX from Indian citizens for filling up of the following vacant sanctioned posts under this Directorate of Printing and Stationery, Assam, Guwahati-21. It is a special drive of recruitment and the posts are reserved only for PwD Candidates. Educational Qualification: Matriculate who have completed course in Letter Press Machine Operator from I.T.I. and passed All India Trade Test conducted by the Government of India after completion of Prescribed Apprenticeship Training in the Assam Government Press or any other Government Recognised Press. Pay: PB- 2 Rs. 14,000/- 49,000/- Grade Pay : Rs. 5,600/- Plus other allowances as admissible under the Rules of ROP, 2017. Educational Qualification: Matriculate and I.T.I. passed who have completed 2 (two) years Apprenticeship Training in Book Binding in the Assam Government Press or any other Government Recognized Press and passed All India Trade Test conducted by Government of India. Age: Candidates / Applicants should not be less than 18 (eighteen) years and not more than 43(forty three) years of age as on 01.01.2017. The upper age limit is relaxable by 5 years in case of SC/ST candidates. Employment Registration No. is mandatory and candidates/ applicants must mention the Registration No. along with date in their applications. Certificate of Disability must be signed by the concerned Competent Authority. (d) Candidates/ Applicants will have to superscribe “Post applied for” at the top of the scaled envelope carrying the application form. Application completed in all respect should reach the DIRECTORATE OF PRINTING & STATIONERY, ASSAM, GUWAHATI-21 on or before 15 days [from 8th September 2017] from the date of publication of the Advertisement. Application received after this date will not be entertained.